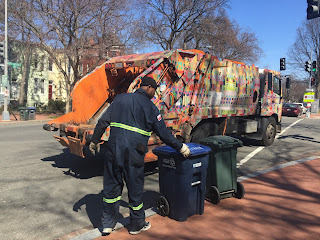 urbanities: Keep On Truckin' DC! Yes, Movable Art! Beauty amidst waste! Ten of these colorful murals have been rolling (and clanking) through the streets of Washington and are expected to be there for two years as another example of public art work funded by DCCAH. (Remember the elephant and donkey sculptures that still may be found occasionally, mainly in residential spaces.) You have to be lucky to catch a sight of one of them, as even the chosen creators themselves have found, but they make a dazzling display when you do. Large dimensional mainly abstract designs covering all sides of these monster vehicles - a reason to stop and pause while hard-working collection men (any women?) drag and tip the blue recycling bins into back bins that open and shut automatically like a mighty maw. Artist Pat Goslee submitted a dream-like painting entitled 'Tale of Three,' inspired by some recycled fabrics in keeping with the general theme. (She found detritus such as netting on city streets.) "The fabric of life as a field of interconnected energies," she writes. "Three small seed forms - each representing significant family roles: parent, child, sibling...." intended to 'invite the viewer to dream and to make imaginative associations." Recycling is "'a key part of the cycle of life' she adds A digital image of the original painting was printed large on vinyl material similar to what is used for ads on Metro buses. She felt honored to be selected, she says, calling the project "an interesting way to use an existing work of art. Its public art, it addresses an important environmental issue." Those chosen received $2500 for their effort.